The following are lists of highest-grossing anime films. It includes the all-time highest-grossing anime films, the highest-grossing anime films by year and the highest-grossing anime film franchises. This article only covers box office revenue, and does not include ancillary revenue from other sources such as home entertainment or merchandise sales. The following chart is a list of the highest-grossing anime films. Ten of these films are also in the top 50 traditional animated films. 86.7% of the films in the top 30 were released after 2000. 2012 is the most represented year on the list, with 3 films. Pokémon is the most represented animated film franchise, with 6 films on the list, while Doraemon, Detective Conan, Dragon Ball and One Piece franchises feature prominently. Studio Ghibli is the most represented studio, with 9 films on the list. Films must have a minimum box office gross of $50 million to qualify for this list. The films on this chart have all had a theatrical run (including re-releases) since 1997, and films that have not played since then do not appear on the chart due to ticket-price inflation, population size and ticket purchasing trends not being considered. The list only includes box office revenue, and does not include ancillary revenue from other sources such as home entertainment or merchandise sales, where a number of anime films earn significantly more revenue. My Neighbour Totoro (1988), for example, grossed $1.4 billion from home video and licensed merchandise sales. Similarly, Castle in the Sky (1986) grossed a total of approximately $156 million in combined box office, home video and soundtrack sales,[a] and Akira (1988) earned $80 million in home video sales. Yo-kai Watch: Enma Daiō to Itsutsu no Monogatari da Nyan! This is a list of highest-grossing anime films by year, since 1977. The most number of films represented are by Doraemon with 12 films on the list, as of 2018. Up until 1999, the Japanese box office was most commonly reported in terms of distribution income (distributor rentals), which was equivalent to approximately half of the total gross revenue at the Japanese box office. Since 2000, the Japanese box office has been reported in terms of total box office gross. The worldwide gross figures for anime films were also not reported prior to 1997. As such, there are two tables. The first table shows the Japan distribution income and box office gross revenue up until 1996, while the second table shows the worldwide gross revenue since 1997. Galaxy Express 999 ¥1,650,000,000 ? The following chart is a list of the highest-grossing anime film franchises. The top six are among the highest-grossing animated film franchises of all time. Doraemon is the top-grossing anime film franchise of all time, and one of the highest-grossing animated film franchises with over $1.6 billion. Doraemon sold more than 100 million tickets at the Japanese box office by April 2015, surpassing Godzilla as the highest-grossing film franchise in Japan. Pokémon has the highest per-film average, with over $50 million per film. A given franchise needs to have at least two theatrically released films to be on this list. Note that many of the box office gross figures given for older films released before 2000 are in terms of distribution income (distributor rentals), which was equivalent to approximately half of the total gross revenue at the Japanese box office. ^ See Castle in the Sky article. ^ The first sixteen Dragon Ball films, from Dragon Ball: Curse of the Blood Rubies (1986) to Dragon Ball Z: Wrath of the Dragon (1995), crossed ¥40 billion in Japan. ^ "Hayao Miyazaki's 'My Neighbor Totoro' Gets China Release Date". The Hollywood Reporter. 11 November 2018. Retrieved 30 January 2019. ^ Blanc, Michelle Le; Odell, Colin (2014). Akira. Macmillan International Higher Education. p. 49. ISBN 9781844578092. ^ "Animation – Anime". Box Office Mojo. Archived from the original on 2012-04-26. Retrieved 2016-02-18. "Your Name (2017)". Box Office Mojo. Archived from the original on 2018-01-13. Retrieved January 19, 2018. "Your Name - International: Germany". Box Office Mojo. Archived from the original on 2018-02-01. Retrieved January 19, 2018. "Spirited Away (2002) – International Box Office Results". Box Office Mojo. Archived from the original on 2014-11-29. Retrieved January 23, 2019. Schwarzacher, Lukas (February 17, 2002). "Japan box office 'Spirited Away'". Variety. Archived from the original on 2014-08-26. Retrieved August 21, 2014. Schwarzacher, Lukas (February 16, 2003). "H'wood eclipses local fare". Variety. Archived from the original on 2014-08-26. Retrieved August 21, 2014. Schilling, Mark (May 16, 2008). "Miyazaki's animated pic to open this summer". Variety. Archived from the original on 2014-07-15. Retrieved July 2, 2014. ^ "Howl's Moving Castle (2005)". Box Office Mojo. Archived from the original on 2015-09-24. Retrieved September 26, 2015. ^ "Ponyo (2009)". Box Office Mojo. Archived from the original on 2015-09-24. Retrieved September 26, 2015. ^ a b "Stand by Me Doraemon". Box Office Mojo. Archived from the original on 2015-09-24. Retrieved March 29, 2016. ^ a b "Princess Mononoke (1999)". Box Office Mojo. Archived from the original on 2015-09-24. Retrieved September 26, 2015. ^ "The Secret World of Arrietty (2012)". Box Office Mojo. Archived from the original on 2012-05-28. Retrieved September 26, 2015. ^ a b "Kaze tachinu". IMDb. Archived from the original on 2016-04-05. Retrieved 18 December 2015. ^ "Pokémon: The Movie 2000 (2000)". Box Office Mojo. Archived from the original on 2016-09-16. Retrieved November 14, 2016. ^ a b c "Dragon Ball Super: Broly (2019)". The Numbers. Retrieved 19 March 2019. ^ a b c "Dragon Ball Super: Broly (2019)". Box Office Mojo. Retrieved 19 March 2019. ^ a b "Meitantei Conan: Zero no Shikkônin (2018) - Financial Information". The Numbers. Archived from the original on 2019-01-22. Retrieved 20 January 2019. ^ "歴代興収ベスト100" [Successive box-office top 100] (in Japanese). Kogyo Tsushinsha. Archived from the original on 2017-08-08. Retrieved 4 February 2018. ^ "待望の映画最新作『ONE PIECE FILM』ついに始動！". Animate Times (in Japanese). 2015-08-23. Archived from the original on 2018-08-14. Retrieved 26 January 2019. ^ "One Piece Film Z (2012) - International". The Numbers. Archived from the original on 2017-10-24. Retrieved June 6, 2017. ^ "One Piece Film Z (2012)". Box Office Mojo. Archived from the original on 2015-09-29. Retrieved September 26, 2015. ^ "영화정보". KOFIC. Korean Film Council. Archived from the original on 2018-12-25. Retrieved 26 January 2019. ^ a b c "『ドラゴンボール超ブロリー』ブルーレイ＆DVDが6月5日(水)にリリース決定！" (in Japanese). navicon. 4 March 2019. Retrieved 9 March 2019. ^ "Pokémon: Diamond & Pearl (2010)". Box Office Mojo. Archived from the original on 2015-09-24. Retrieved September 26, 2015. ^ a b "2016". Eiren. Motion Picture Producers Association of Japan. Retrieved 16 February 2019. ^ "Currency converter in the past - rate". fxtop. September 2016. ^ "One Piece Film Gold". Maoyan. Retrieved 12 February 2019. ^ "One Piece Film: Gold". Box Office Mojo. ^ "One Piece Film: Gold (2016)". The Numbers. Archived from the original on 2019-01-28. Retrieved 2019-01-27. ^ a b c d e Macias, Patrick (2003). Japan's Movie House Masterpieces. DH Publishing. p. 39. ISBN 9780972312448. Archived from the original on 2014-07-23. Retrieved 2018-05-30. ^ a b c "Pokemon 3: The Movie (2001) - International Box Office Results". Box Office Mojo. Archived from the original on 2018-07-23. Retrieved May 29, 2018. ^ "Tales from Earthsea (2010)". Box Office Mojo. Archived from the original on 2015-09-24. Retrieved September 26, 2015. ^ "Meitantei Konan: Junkoku no naitomea (2016)". The Numbers. Archived from the original on 2016-12-20. Retrieved January 27, 2017. ^ a b c 歴代興収ベスト100 [Cumulative Box-office earnings, top 100 ranking] (in Japanese). Kogyo Tsushinsha. August 6, 2017. Archived from the original on August 8, 2017. Retrieved August 25, 2017. ^ a b c "Detective Conan: Crimson Love Letter". Box Office Mojo. Retrieved May 20, 2017. ^ "WOKJ Weekend Box office". Archived from the original on 2017-08-01. Retrieved May 16, 2017. ^ "From Up on Poppy Hill (2013)". Box Office Mojo. Archived from the original on 2015-09-23. Retrieved September 26, 2015. ^ "2010". Eiren. Motion Picture Producers Association of Japan. Retrieved 13 February 2019. ^ "One Piece Film: Strong World". Box Office Mojo. Archived from the original on 2019-01-28. Retrieved 2019-01-27. ^ "WOKJ Weekend Box office". Archived from the original on 2017-08-01. Retrieved May 17, 2016. ^ "Pokemon: Best Wishes (2011)". Box Office Mojo. Archived from the original on 2015-09-27. Retrieved September 26, 2015. ^ "Okami kodomo no ame to yuki (2012)". Box Office Mojo. Archived from the original on 2015-07-10. Retrieved September 26, 2015. "The Cat Returns (2002)". Box Office Mojo. Archived from the original on 2015-09-27. Retrieved September 26, 2015. "The Cat Returns". Box Office Mojo. Archived from the original on 2015-09-27. Retrieved September 26, 2015. ^ "Dragon Ball Z: Battle of Gods (2014)". Box Office Mojo. Archived from the original on 2015-10-02. Retrieved September 26, 2015. ^ "Pokémon 12 (2009)". Box Office Mojo. Archived from the original on 2015-09-27. Retrieved September 26, 2015. ^ a b "A Brief History of Studio Ghibli: The Road to 'Spirited Away'". MANGA.TOKYO. 11 February 2017. Retrieved 16 February 2019. ^ a b "特集・コラム [ 映画ファンド ] －1－　映画ファンドとは　話題作の「北斗の拳」から仕組みを探る". QUICK Corp. February 8, 2007. Retrieved December 19, 2007. ^ a b c 宇宙戦艦ヤマト大事典. ラポート. 1983. p. 131. ^ 宇宙戦艦ヤマト大事典. ラポート. 1983. p. 135. ^ a b "なにかとんでもないことが起こりそうな「宇宙戦艦ヤマト2202 愛の戦士たち」". シネマズ PLUS (Cinemas PLUS) (in Japanese). 2017-02-06. Retrieved 15 February 2019. ^ a b キネマ旬報ベスト・テン85回全史 1924-2011. Kinema Junpo ムック. Kinema Junposha. May 2012. p. 380. ISBN 978-4873767550. ^ "1980年（1月～12月）". Eiren. Motion Picture Producers Association of Japan. Retrieved 19 February 2019. ^ a b c d e f g h i j k "邦画興行収入ランキング". SF MOVIE DataBank (in Japanese). General Works. Retrieved 19 February 2019. ^ "1981年（1月～12月）". Eiren. Motion Picture Producers Association of Japan. Retrieved 12 February 2019. ^ "1982年（1月～12月）". Motion Picture Producers Association of Japan. Archived from the original on 2018-03-06. Retrieved March 5, 2018. ^ a b "日本アカデミー賞にもノミネート 映画「ONE ＰＩＥCＥ」が超えた名作アニメ映画". Naver Matome. Naver. 2013-01-24. Retrieved 19 February 2019. ^ "1983年（1月～12月）". Motion Picture Producers Association of Japan. Archived from the original on 2013-05-22. Retrieved March 5, 2018. ^ "日本国内 1983年 年間邦画興行収入ランキング". Eiga Ranking. Retrieved 18 February 2019. ^ "1984年（1月～12月）". Eiren. Motion Picture Producers Association of Japan. Retrieved 12 February 2019. ^ "1985年（1月～12月）". Eiren. Motion Picture Producers Association of Japan. Retrieved 12 February 2019. ^ "1986年（1月～12月）". Eiren. Motion Picture Producers Association of Japan. Retrieved 12 February 2019. ^ "1987年（1月～12月）". Eiren. Motion Picture Producers Association of Japan. Retrieved 12 February 2019. ^ "1988年（1月～12月）". Eiren. Motion Picture Producers Association of Japan. Retrieved 12 February 2019. ^ a b Kanō, Seiji (1 March 2006). 宮崎駿全書 (Complete Miyazaki Hayao) (Shohan ed.). フィルムアート社 (Film Art Company). p. 148. ISBN 4845906872. ^ "1990年（1月～12月）". Eiren. Motion Picture Producers Association of Japan. Retrieved 12 February 2019. ^ "Kako haikyū shūnyū jōi sakuhin 1991-nen". Eiren (in Japanese). Motion Picture Producers Association of Japan. Archived from the original on July 26, 2011. Retrieved February 6, 2011. ^ a b c d e "超意外な結果!?ジブリ映画の興行収入ランキング". シネマズ PLUS (Cinemas PLUS) (in Japanese). 2016-06-25. Retrieved 15 February 2019. ^ "Kako haikyū shūnyū jōi sakuhin 1992-nen". Eiren (in Japanese). Motion Picture Producers Association of Japan. Archived from the original on 2011-05-11. Retrieved 6 February 2011. ^ Kanō, Seiji (1 March 2006). 宮崎駿全書 (Complete Miyazaki Hayao) (Shohan ed.). フィルムアート社 (Film Art Company). p. 173. ISBN 4845906872. ^ "1993年（1月～12月）". Eiren. Motion Picture Producers Association of Japan. Retrieved 12 February 2019. ^ a b c "過去興行収入上位作品 一般社団法人日本映画製作者連盟". www.eiren.org. Archived from the original on 2011-07-26. Retrieved 2016-08-11. ^ "1996年（1月～12月）". Eiren. Motion Picture Producers Association of Japan. Retrieved 12 February 2019. ^ "Wettbewerb/In Competition". Moving Pictures, Berlinale Extra. Berlin: 32. February 11–22, 1998. ^ "Pokemon: The First Movie (1999) - Box Office Mojo". www.boxofficemojo.com. Archived from the original on 2012-05-20. Retrieved 2016-02-18. ^ "TOPICS". ZAKZAK. 28 January 1999. Retrieved 13 February 2019. ^ "Pokemon: The Movie 2000 (2000) - Box Office Mojo". www.boxofficemojo.com. Archived from the original on 2016-03-02. Retrieved 2016-02-18. ^ Sudo, Yoko. "'Frozen' Ranks as Third-Biggest Hit in Japan". Japan Realtime. The Wall Street Journal. Archived from the original on 2017-03-24. Retrieved 3 January 2016. ^ "Highest grossing movies of 2002" (in Japanese). Motion Picture Producers Association of Japan. Archived from the original on December 15, 2009. Retrieved May 13, 2008. ^ a b "2003年（平成15年）興収10億円以上番組" (PDF). Eiren. Motion Picture Producers Association of Japan. Retrieved 13 February 2019. ^ a b "2005". Eiren. Motion Picture Producers Association of Japan. Retrieved 13 February 2019. ^ "Japan Box Office 2007". Box Office Mojo. Archived from the original on 2015-06-21. Retrieved 2012-11-03. ^ Ponyo (2009) Archived 2011-11-18 at the Wayback Machine. Box Office Mojo (2009-11-05). Retrieved on 2014-05-12. ^ Gake No Ue No Ponyo (Ponyo on the Cliff) (2009) Archived 2014-03-02 at the Wayback Machine. Boxofficemojo.com. Retrieved on 2014-05-12. ^ "The Secret World of Arrietty (2012)". Box Office Mojo. Internet Movie Database. Archived from the original on 2012-05-28. Retrieved June 8, 2012. ^ "Japan Box Office 2010". Box Office Mojo September 10–11, 2011. Archived from the original on 2013-05-20. Retrieved 2012-11-03. ^ Nancy Tartaglione and Anita Busch (April 19, 2015). "'Furious 7′ Drives To $1.15B Global; 'Dragonball' Big In Japan – Intl B.O. Update". Deadline Hollywood. (Penske Media Corporation). Archived from the original on 2015-04-20. Retrieved April 20, 2015. ^ a b c Komatsu, Mikikazu (April 16, 2019). "Japan Box Office: 23rd Detective Conan Film Triumphs with Record-Breaking Opening". Crunchyroll. Retrieved 18 April 2019. ^ "Japan Box Office: 'Doraemon' Anime Still All-Conquering". The Hollywood Reporter. April 6, 2015. Archived from the original on 2018-06-16. Retrieved 2018-09-06. ^ "Pokemon 4Ever (2002) - International Box Office Results". Box Office Mojo. Archived from the original on 2018-06-12. Retrieved May 30, 2018. ^ a b "Movies With Box Office Gross Receiopts Exceeding 1 Billion Yen". Eiren. Motion Picture Producers Association of Japan. Retrieved 17 February 2019. ^ "Pokémon the Movie 20: I Choose You!". www.boxofficemojo.com. Retrieved April 23, 2018. ^ "Pokemon the Movie: The Power of Us (2018) - International Box Office Results". Box Office Mojo. Retrieved 13 February 2019. ^ a b c "名探偵コナン：劇場版新作が興収60億円突破 シリーズ最高記録を更新". MANTANWEB (in Japanese). 2016-06-06. Retrieved 19 April 2019. ^ "予約特典・ドラゴンボール最強への道・劇場版ご近所物語A5サイズ前売特典冊子". 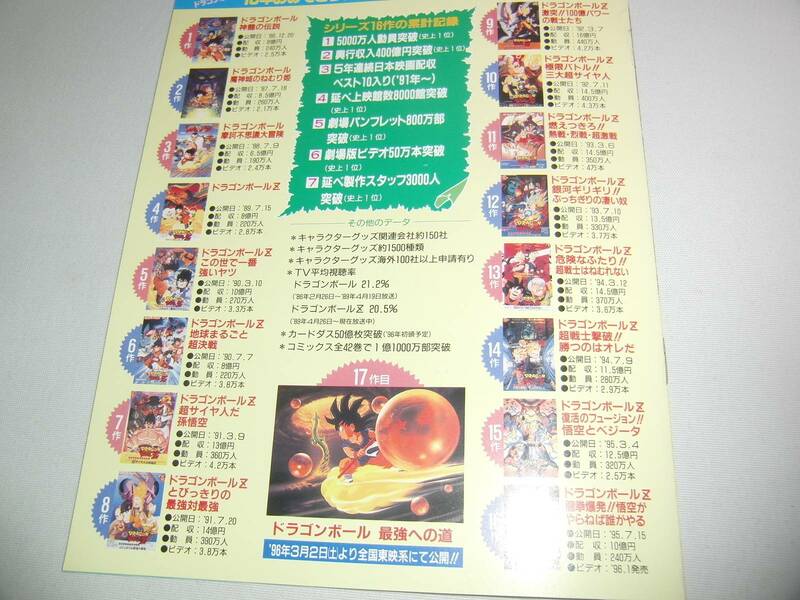 Dragon Ball: The Path to Power brochure. Toei Animation. 1996. Archived from the original on 2013-06-28. Retrieved 2019-01-25. ^ "2001年（平成13年）興収10億円以上番組" (PDF). Eiren (in Japanese). Motion Picture Producers Association of Japan. Retrieved 12 February 2019. ^ "2000年（平成12年）興収10億円以上番組" (PDF). Eiren (in Japanese). Motion Picture Producers Association of Japan. Retrieved 12 February 2019. ^ "2003年（平成15年）興収10億円以上番組" (PDF). Eiren (in Japanese). Motion Picture Producers Association of Japan. Retrieved 12 February 2019. ^ "2002年（平成14年）興収10億円以上番組" (PDF). Eiren (in Japanese). Motion Picture Producers Association of Japan. Retrieved 12 February 2019. ^ "2004". Eiren. Motion Picture Producers Association of Japan. Retrieved 12 February 2019. ^ a b "2008年 日本映画・外国映画 業界総決算 経営/製作/配給/興行のすべて". Kinema Junpo. Kinema Junposha (2009年（平成21年）2月下旬号): 172. 2009. ^ a b c "2007年 日本映画・外国映画 業界総決算 経営/製作/配給/興行のすべて". Kinema Junpo. Kinema Junposha (2008年（平成20年）2月下旬号): 164. 2008. ^ "特殊映像ラボラトリー第34回　2011年上半期・特殊映像総決算". アニメ！アニメ！ビズ (Anime! Anime! Biz). 2011-07-25. Retrieved 15 November 2012. ^ "2010". Eiren. Motion Picture Producers Association of Japan. Retrieved 18 February 2019. ^ "2012". Eiren. Motion Picture Producers Association of Japan. Retrieved 18 February 2019. ^ "2011". Eiren. Motion Picture Producers Association of Japan. Retrieved 18 February 2019. ^ "2009". Eiren. Motion Picture Producers Association of Japan. Retrieved 18 February 2019. ^ a b c d e f Komatsu, Mikikazu (November 21, 2018). "Japan Box Office: PreCure All Stars Memories Earns Impressive 930 Million Yen in 4 Weeks". Crunchyroll. Retrieved February 18, 2019. ^ "Japan Box Office, April 20–21, 2013". Box Office Mojo. Retrieved 19 February 2019. ^ "2018". Eiren. Motion Picture Producers Association of Japan. Retrieved 18 February 2019. ^ "2009年 日本映画・外国映画 業界総決算 経営/製作/配給/興行のすべて". Kinema Junpo. Kinema Junposha (2010年（平成22年）2月下旬号): 173. 2010. ^ "【国内映画ランキング】「プリキュア」首位奪取！「旅猫リポート」は2位スタート". Eiga (in Japanese). October 29, 2018. Retrieved February 19, 2019. ^ a b "2017年映画業界総決算". Kinema Junpo（2018年3月下旬 映画業界決算特別号）. Kinema Junposha (1773): 33. 2018. ^ "39th Doraemon Film Tops Japanese Box Office for 5th Straight Weekend". Anime News Network. 2 April 2019. Retrieved 2 April 2019. ^ a b "2017年映画業界総決算". Kinema Junpo（2017年3月下旬 映画業界決算特別号）. Kinema Junposha (1741): 42 & 70. 2017. ^ "2015年映画業界総決算". Kinema Junpo（2016年3月下旬 映画業界決算特別号）. Kinema Junposha (1712): 44. 2016. ^ "2014年映画業界総決算". Kinema Junpo（2015年3月下旬 映画業界決算特別号）. Kinema Junposha (1684): 78–79. 2015. ^ "アニメが映画界をけん引!?最近のアニメ映画事情". Merumo (in Japanese). GMO Internet Group. 2015-06-19. Retrieved 4 February 2019. ^ "2017". Eiren. Motion Picture Producers Association of Japan. Retrieved 28 February 2019. ^ "Box Office Gross, TV Anime Adaptations". Someanithing (Anime DVD/BD Sales in Japan). Retrieved 25 February 2019. ^ a b c d e f g h i "Digital Monsters". Toei Animation. Retrieved May 30, 2018. ^ a b c "3rd Digimon Adventure tri. Anime Film Tops 55 Million Yen in 4 Days". Anime News Network. September 29, 2016. Archived from the original on 2017-07-03. Retrieved May 28, 2018. ^ "'Digimon Adventure tri. Chapter 5 Kyosei' Synopsis". MANGA.TOKYO. April 28, 2017. Archived from the original on 2018-06-29. Retrieved May 28, 2018. ^ "4th Digimon Adventure tri. Anime Film's Visual Unveiled". Anime News Network. October 14, 2016. Archived from the original on 2018-06-30. Retrieved May 28, 2018. ^ "Digimon: The Movie". Box Office Mojo. Archived from the original on 2018-07-17. Retrieved May 30, 2018. ^ a b c d e "ガンダムで映画化された作品を振り返る". データガンダム (in Japanese). 2018-10-11. Archived from the original on 2018-12-15. Retrieved 2018-12-12. ^ a b "2005年度 日本映画・外国映画 業界総決算 経営/製作/配給/興行のすべて". Kinema Junpo. Kinema Junposha (2006年（平成18年）2月下旬号): 178. 2006. ^ "2014 Japan Yearly Box Office Results". Box Office Mojo. Archived from the original on 2018-06-21. Retrieved May 16, 2018. ^ "Godzilla Opens at #8, Detective Conan Stays at #1". Anime News Network. 2018-05-22. Retrieved 19 February 2019. ^ Komatsu, Mikikazu (March 3, 2015). ""Gundam The Origin" Chapter 1 Opens to Highest Per Theater Average". Crunchyroll. Retrieved 19 February 2019. ^ 宇宙戦艦ヤマト大事典. ラポート. 1983. p. 137. ^ "『宇宙戦艦ヤマト 完結編』の詳細情報". Eiga Ranking. Retrieved 18 February 2019. ^ "2009 Japan Yearly Box Office Results". Box Office Mojo. Archived from the original on 2018-05-17. Retrieved May 16, 2018. ^ "2018 Japan Yearly Box Office Results". Box Office Mojo. Archived from the original on 2018-05-17. Retrieved May 16, 2018. ^ a b "2017 Japan Yearly Box Office Results". Box Office Mojo. Archived from the original on 2018-05-17. Retrieved May 30, 2018. ^ a b "映画「それいけ！アンパンマン」 22年ぶりに興収4億円突破、さらに更新中". アニメ！アニメ！ビズ (Anime! Anime! Biz) (in Japanese). August 13, 2012. Retrieved February 12, 2019. ^ "映画『アンパンマン』が興収5.2億円突破の大ヒット！シリーズ記録更新中". Livedoor News. September 2, 2015. Retrieved September 15, 2015. ^ "Kinema Junpo" (2017年3月下旬号). March 2017: 42. ^ "Kinema Junpo" (2016年3月下旬 映画業界決算特別号). March 2016: 55. ^ "My Hero Academia Film Earns 500 Million Yen to Rank #4 in Opening Weekend". Anime News Network. 2018-08-07. Retrieved 19 February 2019. ^ "Kinema Junpo" (2018年3月下旬 映画業界決算特別号). March 2018: 33. ^ "『それいけ！アンパンマン 妖精リンリンのひみつ』の詳細情報". Eiga Ranking. Retrieved 18 February 2019. ^ "2013年 日本映画・外国映画業界総決算". Kinema Junpo（2月下旬決算特別号）. Kinema Junposha (1656): 201. 2014. ^ "Japan Yearly Box Office". Box Office Mojo. 2011. Archived from the original on 2018-08-14. Retrieved August 13, 2018. ^ "映画『アンパンマン』3年連続の興収4億円突破確実！第2弾来場特典オリジナルカード配布決定 ｜ テレビ関連ニュース". DOGATCH. 2014-08-19. Retrieved 20 August 2014. ^ a b "それいけ！アンパンマン☆映画☆作品一覧☆年代別まとめ". Naver Matome. Naver. ^ "日本映画フリーブッキング作品配給収入". Kinema Junpo (1993年（平成5年）2月下旬号): 147. 1993. ^ "日本映画フリーブッキング作品配給収入". Kinema Junpo (1992年（平成4年）2月下旬号): 143. 1992. ^ "『それいけ！アンパンマン シャボン玉のプルン』の詳細情報". Eiga Ranking. Retrieved 18 February 2019. ^ "Japan Box Office Report – 01/18~01/19". tokyohive. 6Theory Media, LLC. January 22, 2014. Archived from the original on 2018-07-17. Retrieved May 30, 2018. ^ a b The Castle of Cagliostro (Audio Commentary by Reed Nelson) (DVD). Altamonte Springs, Florida: Discotek Media. 1979. ^ "Rupan sansei: Kariosutoro no shiro (Lupin III: Castle of Cagliostro)". Box Office Mojo. Archived from the original on 2018-11-20. Retrieved 19 November 2018. ^ "Lupin the Third: The Castle of Cagliostro (2017 re-release) (2017)". Box Office Mojo. Archived from the original on 2018-11-20. Retrieved 19 November 2018. ^ a b c "過去興行収入上位作品 一般社団法人日本映画製作者連盟". www.eiren.org. Archived from the original on 2017-08-02. Retrieved June 1, 2018. ^ "『さよなら銀河鉄道999 アンドロメダ終着駅』の詳細情報". Eiga Ranking. Retrieved 18 February 2019. ^ "過去興行収入上位作品 一般社団法人日本映画製作者連盟". www.eiren.org. Archived from the original on 2018-07-02. Retrieved June 1, 2018. ^ "Yu-Gi-Oh! : The Dark Side of Dimensions Film Surpasses 1 Billion Yen at Box Office". Anime News Network. Archived from the original on 2018-07-14. Retrieved May 16, 2018. ^ "Yu-Gi-Oh! The Dark Side of Dimensions (2017) - Box Office Mojo". www.boxofficemojo.com. Archived from the original on 2018-04-21. Retrieved 2018-05-30. ^ "Fate/kaleid liner Prisma Illya". Box Office Mojo. Archived from the original on 2018-06-24. Retrieved June 24, 2018. ^ "2013年（平成25年） 興行収入１０億円以上番組" (PDF). eiren.com (in Japanese). Archived (PDF) from the original on 2018-04-13. Retrieved June 24, 2018. ^ "Puella Magi Madoka Magica the Movie: Rebellion". Box Office Mojo. Archived from the original on 2018-06-12. Retrieved June 11, 2018. ^ "「THE IDOLM@STER MOVIE 輝きの向こう側へ!」公開土日で81,262人を動員！". gamewatch (in Japanese). Archived from the original on 2018-06-25. Retrieved June 24, 2018. ^ "Puella Magi Madoka Magica the Movie". Box Office Mojo. Archived from the original on 2018-06-12. Retrieved June 11, 2018. ^ "劇場版「魔法少女まどか☆マギカ」2部作で興収10億突破". eiga.com (in Japanese). Archived from the original on 2018-06-12. Retrieved June 11, 2018. ^ "Fate/stay night, Touken Ranbu, Love Live! Sunshine!! Films Stay in Top 10". Anime News Network. Retrieved February 5, 2019. ^ "2010 Japan Yearly Box Office". Box Office Mojo. Archived from the original on 2018-06-21. Retrieved May 30, 2018. ^ "Gekijoban Gintama Kanketsu-hen: Yorozu". Box Office Mojo. Archived from the original on 2018-07-17. Retrieved May 30, 2018. 2016 film: "Detective Conan: The Darkest Nightmare". Box Office Mojo. Retrieved May 4, 2017. "Pokémon: The First Movie (1999)". Box Office Mojo. Retrieved September 26, 2015. "Pokémon: The Movie 2000 (2000)". Box Office Mojo. Retrieved September 26, 2015. "Pokémon: Destiny Deoxys (2004)". Box Office Mojo. Retrieved October 31, 2008. "Gekijô-ban poketto monsutâ: Adobansu jeneręshon pokemon renjâ to umi no ôji manafi (2006)". Box Office Mojo. Retrieved October 31, 2008. "Pokémon: Diamond and Pearl (2007)". Box Office Mojo. Retrieved October 31, 2008. "Pokémon Diamond & Pearl the Movie: Giratina and the Frozen Sky's Bouquet: Shaymin (2008)". Box Office Mojo. Retrieved October 31, 2008. "Pokémon 12 (2009)". Box Office Mojo. Retrieved October 31, 2008. "Pokémon: Diamond Pearl Gen-ei no hasha zoroark (2010)". Box Office Mojo. Retrieved October 31, 2008. "Pokemon: Best Wishes (2011)". Box Office Mojo. Retrieved October 31, 2008. "Pokemon: Best Wishes 2012 (2012)". Box Office Mojo. Retrieved October 31, 2008. "Pokemon: Best Wishes 2013 (2013)". Box Office Mojo. Retrieved October 31, 2008. "Pocket Monster The Movie WY 2014". Box Office Mojo. Retrieved October 31, 2008. "Top 39 Grossing Domestic Japanese Films of 2015 Listed". animenewsnetwork.com. January 30, 2016. Retrieved May 2, 2017. "Pokémon the Movie: Volcanion and the Exquisite Magearna". Box Office Mojo. Retrieved October 31, 2008. "Pokémon The Movie: Volcanion And The Mechanical Marvel". Box Office Mojo. Retrieved November 23, 2017. "Pokémon the Movie 20: I Choose You! (2017)". Box Office Mojo. Retrieved November 11, 2017.